Recipients of UW-Green Bay Professorships, 2017 to 2022. From left: Amy Wolf (Biology), Gaurav Bansal (Management Information Systems, Statistics) and David Coury (Humanities). 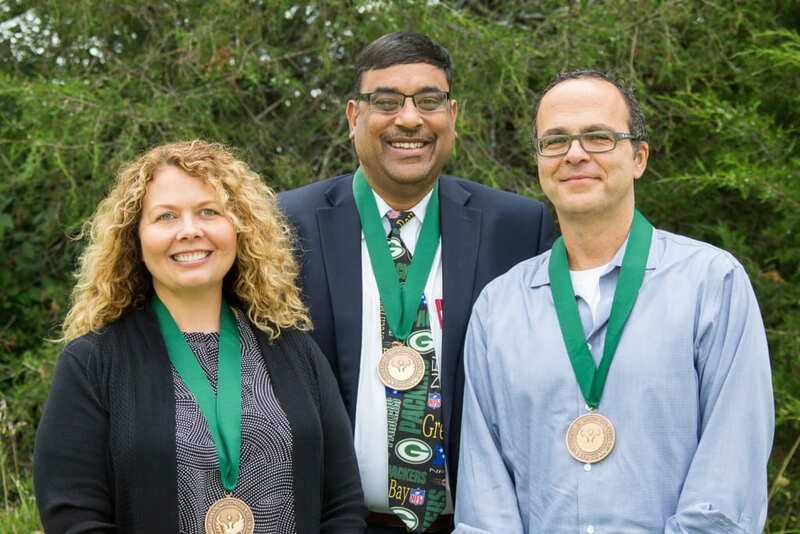 Three members of the University of Wisconsin-Green Bay faculty were selected to hold named professorships today (August 23, 2017) at the University’s 2017 Fall Convocation. Named professorships are created through private gifts that support the study and research of a faculty member who has an outstanding record of scholarly accomplishment. The annual stipend associated with these professorships is for five years, but the recipient retains the title for life. Stipends are typically applied to research expenses or special projects benefiting students or service to the community. The Frankenthal Professorship was established in October of 1980 in honor of the late Siegfried W. Frankenthal by members of the Frankenthal family of Green Bay. The Frankenthals owned and operated Packerland Packing Company until the business was sold in the 1970s. Mr. Frankenthal and his wife, Karola, were active in their synagogue and community charitable work. Their memorial professorship is open to full professors in any field of study whose work exemplifies the spirit and mission of UW-Green Bay. Coury’s record shows sustained scholarly work while serving two terms as chair of Humanistic Studies (now Humanities), one of the University’s largest academic units. He has also chaired Modern Languages. Coury is extensively published and participates in multiple scholarship networks that focus on topics ranging from German film and literature to immigration and national identity. Originally a scholar of German literature, he has effectively retrained himself to also specialize in politics, religion and culture — specifically at the intersection of Middle Eastern studies and globalization. His strong public presence is well documented by his leadership of the Green Bay Film Society and, most recently, his passion to bring the topic of immigration and refugees to hundreds of middle school students in partnership with the Neville Public Museum. His work spans countries and continents — as co-founder and co-director of the Center for Middle East Studies and Partnerships, as an advocate of study abroad and as a visiting instructor in Spain. His passion is connecting UW-Green Bay students and the Green Bay community to global issues. As an undergraduate, Coury studied in Salzburg, Austria and later at the University of Hamburg, Germany. He has published widely on contemporary German cinema as well as the contemporary novel. More recently he has been studying the intersection of Eastern and Western cultures as expressed in European literature and film. Of particularly interest is the role globalization has played in shaping conceptions of identity as well as the so-called clash of cultures and civilizations in Europe. An avid cinephile, he is also the director of the Green Bay Film Society and serves on the board of Film Green Bay. He earned a bachelor’s degree from Wittenberg University (Springfield, Ohio) and a Ph.D. from the University of Cincinnati. The Herbert Fisk Johnson Professorship in Environmental Studies was established in 1985 by Samuel C. Johnson and his wife, Imogene Johnson of Racine. It is named in honor of his father. Herbert Fisk Johnson was the grandson of Samuel Curtis Johnson, founder of Johnson Wax Company. He led the company to its present position as a world leader in the manufacture and marketing of wax, wax products and other products produced by the company. Samuel and Imogene Johnson were among the early supporters of UW-Green Bay and remained friends of the University over the years. Samuel passed away in 2004. The award recognizes and gives support for a full professor who has demonstrated a productive commitment to scholarship and outreach and whose work exemplifies the spirit and mission of the University. The Johnson Professorship is designated for the areas of biological or physical environmental studies or policy studies of environmental issues. Prof. Wolf is known as someone who exemplifies the University mission in her teaching, scholarship, service and outreach. Her interdisciplinary problem-focused scholarship address the University’s commitment to environmental sustainability and to serving communities in Wisconsin. Her scholarship focuses on forest ecology, species preservation and ecological restoration. In 2014, she was recognized with the Founders Award for Excellence in Scholarship. She is widely published and most recently, in collaboration with Prof. Bob Howe and other UW-Green Bay researchers, contributed to work published in Science — considered the premiere scientific journal in the world. She serves as a mentor to UW-Green Bay undergraduates and graduates. As both the principal- and co-investigator, she has acquired more than $1 million in grants administered through UW-Green Bay for research. Her work typically focuses on the ecology of plant-animal interactions, including studies of host specific insects (Northern Blue Butterfly), rare plants (Serpentine Morning Glory), and Wisconsin bees. She is co-leader of the Wabikon Forest Dynamics Plot, part of a global network of intensive, long-term forest research sites initiated by the Smithsonian Institution’s Center for Tropical Forest Science. Hundreds of undergraduates and graduates under her supervision have studied invasive plant species, aquatic macrophytes, forest understory plants, bat biology and pollination ecology. Wolf received both her master’s degree (Environmental Science and Policy, 1993) and bachelor’s degree (Biology, 1989) from UW-Green Bay. She earned a Ph.D. in Ecology from the University of California, Davis in December 1998. The Frederick E. Baer professorship recognizes and gives support for a tenured faculty member who has demonstrated a productive commitment to scholarship and/or outreach, and whose work exemplifies the spirit and mission of UW-Green Bay. It is specified for faculty members who work directly with business leaders, in business development or with students who later enter the business world. Scholarship namesake, Frederick E. Baer, had a distinguished 44-year career with Paper Converting Machine Corporation, culminating in his tenure as the company’s president and CEO from 1969 until his retirement in 1993. Bansal is well known for leadership in curricular development and for engaging the business community in the region. He serves as the chair and academic director for the Master of Science in Data Science program, a high-enrollment program with a national reputation. He currently teaches courses in business statistics and MIS for the Cofrin School of Business. His research interests are in the areas of trust, privacy and security concerns and data analytics. He is extensively published and received best paper awards at the Midwest Association for Information Systems (MWAIS) conferences in 2010, 2011 and 2014. In 2016, he organized a two-day workshop at UW-Green Bay which focused on SAS business analytics software, drawing workshop leaders from across the country and business leaders from across the region. Bansal was recognized as a UW-Green Bay Teaching Scholar in 2010-2011 and a Wisconsin Teaching Fellow in 2013-2014 and an Advanced Online Teaching Fellow in 2013. His research has won several nominations and best paper awards at prestigious national and international MIS conferences. He encourages and enjoys working with his students on research projects. His research wok with UW-Green Bay undergraduate students has won best paper awards at regional MIS conferences. Bansal is an engaged community member and a proud alumnus of the Chamber of Commerce’s Leadership Green Bay program. He serves on the Brown County Martin Luther King, Jr. Birthday Celebration Event Committee and as a steering committee member of Community Information Systems (CIS) — an initiative of United Way of Brown County. Bansal received his Ph.D. in MIS from UW-Milwaukee in 2008 and his M.B.A. from Kent State University, Ohio in 2002. He completed his bachelor’s degree in Mechanical Engineering from University of Gorakhpur, India in 1996. Before starting his academic career, he worked as a quality assurance engineer for General Motors India (1998-2000) and Daewoo Motors India (1996-1998). The University of Wisconsin-Green Bay is a comprehensive public institution offering undergraduate and graduate programs to 7,300 students. The University transforms lives and communities through exceptional and award-winning teaching and research, innovative learning opportunities and a problem-solving approach to education. For more information, visit www.uwgb.edu.